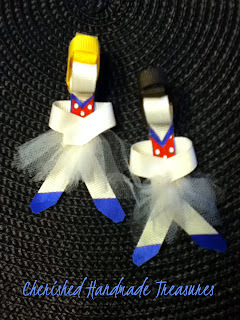 These are a couple of little hair ribbons I made for my two granddaughters. They're sisters, the oldest is a brunette and the younger one a blonde. 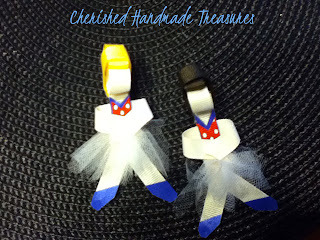 These look really cute clipped to the center of a big bow or pinned on a headband. I have begun making several of the Disney Princesses hair clips also. I will start posting them as I finish them up. Those came out great! Thanks for sharing on We Made That!